Ever really screwed things up and wanted a do-over? Yeah, the gringa does that all the time. That’s what makes time travel so appealing. But is it possible? Theoretically, sure it’s possible, but only if you want to see the future. To start the day all over again in order to get it right the second time around means travelling faster than light and that, theoretically, is impossible. But, actually, that’s good news. That means a spiteful ex can’t travel back in time and take out your grandfather, thus wiping out your future existence. It also means that adventurers who travel to the future have to stay there (maybe). For a trip to tomorrow, it’s actually relatively easy, according to scientific formulas (although no one’s actually done it yet, I think). You see, if a person hopped on board their spaceship and zipped away into the cosmos at even a fraction of lightspeed, for a journey of say a year or two, they would return to an Earth that had aged perhaps by decades. So, technically, the galactic pioneers traveled to the future. But Einstein offered another option to travel to the future in the blink of an eye, wormholes. A wormhole is a time tunnel that connects different parts of the universe. By using the wormhole as a direct route across the universe, rather than taking the long route of flying through the curved mass of space, a person would emerge, within moments, in a completely different time zone, perhaps an entire era altogether, hundreds of years in the future. The furthest a person could then go back in time would be to simply use the wormhole to return to the point they started from. However, a Caltech physicist by the name of Kip Thorne believes that quantum theory suggests that once a person traveled through a wormhole it would collapse behind them. A wormhole to the future might be a one way ticket to tomorrow. So, if you want to have a time traveling adventure, you just have to find a wormhole. Or go to China. Yep. That’s what the gringa said. Go to China. 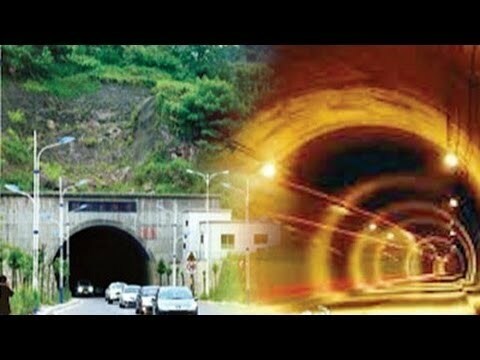 Interesting reports have been in the news for a few years now about a time travel tunnel in China. Located in Guizhou Province, time travelers can break all the rules and travel back in time. You don’t even need a spaceship. You can use the ancient technology of cars. It only takes, technically, about five minutes to travel the 400 meter length of the tunnel. However, when drivers emerge on the other side of the tunnel their electronic devices indicate that they have traveled back in time about one hour. However, time is a jealous mistress. It seems to not appreciate being lost and chases down evaders like a jilted lover turned crazed stalker. Once people travel some distance from the tunnel their lost hour catches up with them. A transmitter in the tunnel is resetting everyone’s electronic clocks which reset once again when they receive new GPS signals from a different transmitter after emerging from the tunnel. The gringa doesn’t really care why. It seems harmless and loads of fun. The gringa would like to go back and forth several times, perhaps hundreds of times, maybe thousands just to see what might happen. Maybe I’ll lose a wrinkle or two. Ever since the gringa was a little girl, she has loved fairy tales. Stories of magic and elves rate right alongside stories of spaceships and far-and-away star colonies. Of course, whenever the gringa imagined the fairyland setting of a wooded glen with magical sprites and naughty gnomes, the picture in my mind was of emerald green meadows filled with colorful flowers and dark forests with friendly woodland animals. A picturesque image to be found in places like Ireland or jolly aulde England. Never in a kazillion years would the gringa have linked fairy tales with southern Africa or western Australia. Now scientists have gone and turned my childhood fantasy world upside down. The gringa loves the old tales and fantasies of midnight revelries rising up to the surface of the earth as the magical middle Earth creatures enjoy the moonlight and starlight while humans sleep. I am sorely disappointed that scientists had to go and destroy this little piece of illogical, creative, mental space in my mind by announcing they have solved the mystery of fairy rings. And they even went and renamed the phenomena, calling them “fairy circles”. I suppose scientists prefer a geometric term to a more poetic counterpart. Doggone them all. South of Angola toward South Africa’s Northwestern Cape province is a vast, barren region of land that is mostly uninhabited. It is dotted with reddish and golden earth circles within the grassland. The fairy circles vary in size from about 7 feet in diameter to almost 50 feet in diameter. This strange geographical feature has been romanticized in literature and local myths. The bushmen of this area claim the fairy circles belong to divine gods and possess magical powers. Some say they are the footprints of the gods themselves. Recently, these same types of circles were discovered in Australia’s Pilbara region. Much to the gringa’s dismay, the mystery has now been solved. This year an environmental research group published their official findings of what exactly causes fairy circles. However, if the gringa so chooses, she could put her own spin on their determinations. A fairy circle would no longer be the work of fairies, elves and sprites, but of the living forest itself. What scientists have concluded is that the fairy circles are definitely not the work of termites or ants. It is more probable that they are the work of plants organizing themselves in certain patterns as they compete for scarce water resources. The gringa sees literary and poetic potential in this theory. Although such a tale lacks the mischievous fun of fairies and nymphs, it would still contain delightful magical potential. So, all is not bad news. Join the gringa as I read aloud chapter three in “The Magician’s Nephew”, book one of “The Chronicles of Narnia” by C.S. Lewis. Polly and Digory met and explored the attic. They had a run-in with Digory’s crazy Uncle Andrew and now Polly has disappeared! Join me now to find out if Digory searches for Polly and find out about the mysterious Wood Between The Worlds.